Just wanted to bring to your attention an online customer booking system that will be available to our members either later today or tomorrow. I know some of you use Journese so this won't be so interesting to you (for now). For those either without the budget for something like Journese or the time to set up an online booking system, our solution could work well for you. In it's current (first version) form, customer are able to register and post bookings that will appear in your 'unallocated work' on mtvan. They will be able to view a list of reference numbers and addresses of their recent bookings. They are able to sign back in at a later time to view their previous bookings and post more work to you for a quote. All this will take place on your website. It's very easy for you to implement, there is just one line of code that you will need to add to an appropriate place on your site and we do the rest of the work to populate the various screens. You will need to have your web address listed in your details on mtvan (most of you do anyway) as your personal customer booking screens will only work when added from your URL (security). Let me know if you're interested in giving it a go. I'll be able to help you get things set up if you run into difficulties. P.S. Currently free for PRO and non-PRO members. We add an unobtrusive acknowledgement at the bottom with a link to your mtvan profile. I'm going to write a quick story to post in the mtvan blog about customer bookings and mtvan... first to give it a go gets a mention and a link from the article. Let me know if you need any help or if you have any problems. Well there's a thing!! I've just built my own put it up on Friday could have saved a bit of time!! I'd be interested in looking at a dummy site if that's possible. I'll get one together for you to look at soon. The customer login etc is setup to register and create new bookings for me obviously. The bookings arrive automatically on my mtvan account in the "Unallocated Bookings" page. Worth pointing out that in Tim's example the code has been added to a Wordpress post. Hi, did you add the box on my site of 'Shipment'?? Just out of interest, just shows how often I look at the site!!! Nope, just removed the main content and the box on the right hand side. Increased the width of the main content box. I reckon the most useful thing is missing!! The ability to produce a price/quote based on the mileage the page has produced, now that would be really use full. Also saves trying to drive, juggling blackberries and talking on the other line all at the same time!! Springer Express, I agree that that would be useful. I'm sure it will continue to evolve that way, along with payments from your customer possibly. It's a case of where do you stop to actually release something rather than continually adding more and never having something releasable. I want to finish the iPhone app but will look into quotes for you. Does the system you've just implemented offer quotes? If so mind if I enter some test details to try it out? Would providing quotes on the mtvan system do it for you and convince you to implement it? Please give me some details about the complexity of your rate tables. I think the booking form i put on our website is not quite right. When say a customer fills in the form the last thing they do is press QUOTE. I can't see how this is for a quote because where on the online booking form on the mtvan site is the facility to send back a quote? mainly because it's how I do it and I don't think I'm alone!! The mtvan one will soon include an optional rate table (that you can set). I think that's why it says "Get Quote" in the button, which it shouldn't until we have rate tables, so we'll be changing that button to "Book Now". "How much from A to B?" "I was looking for a price more like £100"
"OK, well obviously I can't do it as a hotshot for that price, but you can book it on our website, on a no-obligation basis, and we'll try to get a lower non-urgent price for you." So the customer books online, and you can open the job (which is on your unallocated bookings screen) for bids to see what price you get. Then you can add your margin and go back to your customer. I Have the online booking page up and running now which works well for Google Chrome and Firefox browsers but in IE it is clipped and incomplete, ie no button to press send or quote? I'm unable to test it this second, but I've tweaked it a little which might sort out your IE problem. Is it possible that we can receive an email alert when a booking is made? Sorry Richard, I may have not made myself clear. I was talking about the online booking form. I did a dummy booking from my daughters business and it appeared in unallocated but I didn't receive any notification that it was there. Also, I did not enter the business name for her when registering and now I can't add this? just teething problems I reckon! Yes you should get an email when a booking is made by your customers, I'll see if I can see what's going on but it was working for me the other day. I think the good thing that will come from this is the ''how would it be to transport a packet of crisps I've just bought on ebay'' type phone calls you get all over the weekend, you could always put an explanation that if it's an ebay job email for a quote. Admin, I have found out why I was not getting alerts, my settings had reverted to off, it has done this on several occasions. All working now. Just a question! if I have my alert radius set to 50 miles and some one from London asks for a quote from London to Sheffield via web bookings, will I get an email? same question applies to work posted on site by vendors? @3D Lots of your emails bounce back to us, "reason: spam rejection", which is why the system keeps setting you to get no emails. Probably worth a few minutes effort to set us as a safe sender. @3D, no you'll get an email every time a customer books on your web booking page on your website. The radius settings apply only to bookings placed by vendor-members on mtvan. Thanks Tim, lets hope the page works! As for rejected emails I am at a loss as I don't have a spam filter. Used to have one but I found I still had to read them to find out if they were spam, so no point. If you're using an email provider, eg gmail, aol, or hotmail to forward your @3dcouriers.com emails, they tend to filter stuff without asking, obviously. Yes AOL are bad, I think Yahoo are probably the worst. Hotmail not great. Also worth knowing that I think btconnect/btinternet etc etc are powered by Yahoo, so suffer from the same completely OTT unhelpful filtering. Google is much better. I think their filtering is much more advanced and therefore is less brute force. We do absolutely everything we can to authenticate our emails as not spam - not many do. Ive just realised there is not a delivery time window, do you think this would be a useful addition? As requested we have added a delivery time window. I have tested it myself and don't appear to have any problems as either a new or existing customer. However, of course let me know if you find something that you think might not be right; Sometimes it takes different users to uncover any bugs. i think most ppl ring up as they can then explain what they want and get an answer. then again im new so i didnt think i would as all my work is subbed or word of mouth. I can't see it on your site. Are you sure the domain you're editing from matches your domain? Perhaps try publishing whatever you're editing and see if it appears. I'm guessing you're previewing or editing your site on the domain www.wix.com? Nope, still doesn't work even after I've published it. Should I type in the box on mtvan that my domain is www.wix.com? OK, the problem is that on your site the booking stuff has been put into a frame with a different domain name - static.wix.com. It will work if you put static.wix.com as your website, but obviously that will show as the link to your site, so far from ideal. Is there any other way you can set it up? Your 'Make a booking' title and text is actually on your domain name, not an iframe. Is there any way you can get our code into there? Managed to get it on to www.ddrsamedaycourier.co.uk but can't expand the width fully to accomodate. P.S. There's a button in the forum toolbar to make clickable hyperlinks. You've place the script tag inside a div that has the style property width:497px;. If you increase this wisth to something like 600px or 650px it should be enough, however it may upset the layout of the rest of your page. If you wanted a bit of white margin round the booking page, you could also add something like background:#fff;padding:10px; to that div's style tag. The website is all pre set templates and I've changed the site completely to find the largest option for the form. It should still work fine. Ignore the link text. Added in error. I'd still like to try this out but am having trouble. Are you saying I'd need to put static.wix.com as my website address under my mtvan profile information? Cos as you say, that wouldn't be ideal? I'm a total novice at html etc, hence using wix, so I don't have any bright ideas. It's possible that using static.wix.com would make it work (if that's the domain the screen is added on), but far from ideal. I've sent you a message with more ideas, please get back to me. Although we managed to work around Zenith's problems previously (detailed in posts above), we have now made significant improvements to the configuration page that should solve any other problems similar to this: you can now add multiple domain names! You should always keep your normal nice customer facing domain as your primary domain, this is what shows on your profile with a link back to you (good for Google). If for some reason your content pages are on a different domain (might be a sub-domain or another domain like 'static.wix.com' depending on your CMS) then you can add the domain that the customer booking screen will be on as an 'Additional Address' and it will work as normal. Please let us know if you run into any difficulties and we'll try to help you out. I have added both my web pages and adjusted the HTML code provided, just displays on both domains "Booking system not enabled for this domain." That's working perfectly on my (www.3dcourier.co.uk) site. Thanks Richard. I've removed the http:// for you and it works fine, take a look. Strange, it is meant to cope whether you type the http:// or not, I'll look into it. Strangely enough, when I go into my site in edit mode I get the same but when I view it through a search engine it works fine. I expect the editor you use is on a different domain (look at the url bar)? If not then there might be a frame on the page that is on a different domain. Fault only occurred when I added the second domain, I did not alter the first domain name at all, I was aware after I made the changes that the Html code changed so I updated both sites with the new Html. All working fine now, just a quirk with the new settings maybe? I just viewed your site and it's not working. Sorted. Another url with http:// problem (so I've removed the http:// which we don't need). I will look into it and fix whatever is going wrong later today. Hi Richard, this is the editing domain, is that why? If it is it's not ideal but I'm ok with it so long as it works online. Yes this is why. You could also add sitebuilder.yola.com to your additional addresses if you want it to preview correctly. Ive just added to a new page and still getting the message "HTML content will be modified"
WARNING: Your HTML contains some tags that are not permitted. These have been removed from your changes. I recall you said something about iframe a while ago? For me to use an iframe, I would need URL to content. You've pasted the code into a rich text editor that has replaced characters. It must be pasted in plain text. Take a look at the source code on your web page and you'll see that the code is not actually on the page, it has been altered by the rich text editor. What's your CMS/editor? You need to allow the script tag. Richard, "Yes this is why. You could also add sitebuilder.yola.com to your additional addresses if you want it to preview correctly." Do you do this or me? If it's me, where? If it's you, yes please. At the top go to Dashboard->Customer Booking. There you can click the Add Address button. I'll look into making a 'Gadget' option for you to add (and other sites that use them). Doesn't look too hard. Anyone else interested in the system quoting from a rate table? This bug that was affecting urls typed in with http:// or https:// to begin with should now be fixed. Richard, I added the sitebuilder url this morning, as suggested, but nothing has changed. Does this take time? Really keen to add this to our website but only if the white background gets sorted. How you doing with that? No it is instant. What you're describing sounds like the preview is actually in a frame that has a different domain. If you're on firefox you can right click on the preview area, if it's within a frame you'll have the option to 'this frame->show only this frame'. If you can do this then you'll be able to see what domain the frame is on (in the url bar). Not there yet obviously but I am intending to make a degree of customisation available. Whoa, that messed up the whole site. I'm leaving well enough alone. By the way, you know how we have a skip to latest button, can we have a "back to top" button please. Could we each configure our own rate table? Yes, I should think so. Please start a new thread. Hi GMC, please go to the admin page again and try the Google Gadget url that I have added there and let us know how you get on. I've tried it on iGoogle (supports Gadgets) and it works for me. Booking system not enabled for this domain (www-ig-opensocial.googleusercontent.com). To make it work I would add www-ig-opensocial.googleusercontent.com to my additional urls. I've made a Google site and I have to say I'm really struggling to see how this will work. Google do not want anything out of the ordinary going on. Great, looking forward to getting it on my website. I think this industry is too complex to have an automated quoting system. I, personally, would prefer to talk to my "customer" to find out exactly what they want. The system would have to deal with so many variables and a misquote could quite easily make a prospective new customer go elsewhere. e.g. If I get an enquiry from Sheffield to Newport (Wales) Google will take me down the M5 to the Severn crossing. We all know that is not the way to go but how will the system cope with that? I think this industry is too complex to have an automated quoting system. I, personally, would prefer to talk to my "customer" to find out exactly what they want. I think it's a move forward. We are in the process of rebranding I'm going to include it in our new website. I've added this to my website and was looking at it from a customer's point of view. How is a customer able to retrieve their password if they have forgotten it? There is nothing there to allow them to do that. OK, the 1st version of booking system customisation is now available. 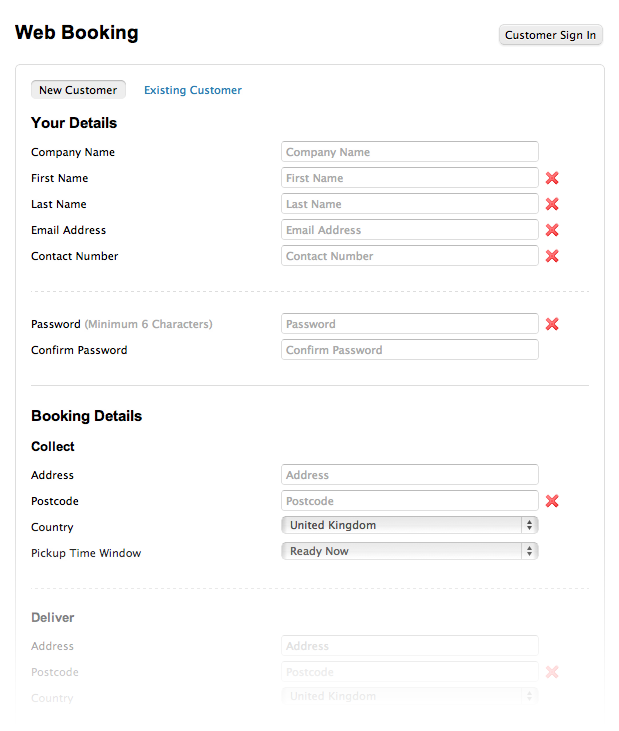 If you navigate to the normal customer booking screen page you'll see a tab that says 'customisation'. Click on that and you'll get options to change the background colour and switch the box borders off. I will make a small change shortly to make the other dividers etc fit in with whatever background colour you choose automatically. LOL - I've changed my website since then but I'm sure others will benefit from this customisation. Thanks for doing it though. Hmmm I can see what's happening. The script tags are showing on the page which means your editor has parsed them and replaced them with code so they display on the page (take a look at the source of your website/HTML). You need to add them in a HTML editor/direct input. And recoloured to fit in with his background using the new customisation options we've recently added (see my post previously on this thread). Any update on the proposed rate table making this booking system a quoting facility as well? No update right now I'm afraid, but it's getting closer to the top of the list. Possibly, and it's a good point (think it might have been raised before somewhere). My aversion to 'Book Now' is I didn't want the commitment that some (potential) customers might feel with a button that says 'book' on it, especially when there's no agreed price yet. Maybe the title needs changing. Looks to me that the booking form is more for booking a job rather than requesting a quote. Maybe Request Booking would be more apt with a note to say we will contact you to confirm booking or something along those lines? Suggestions, anyone? Also, could there be an option for members to limit the type of vehicles they have? For example, I have a small van so having the other vehicle types listed wouldn't do me any good. I would like to clearly state what van(s) I have to prevent unnecessary booking requests for vans I don't have. If other members want the extensive list then fine but at least members should have the option to amend the vehicle types as they see fit. Can this be done? On the booking system when a customer signs in is there or is it a possible to put an option up for them to view their previous quotes? They can currently see a list of their previous jobs/ref numbers but not the details. Adding the option to see the details is definitely a possibility. Good stuff. I have had a couple of customers asked for it previously. Allows them to refer back to previous quotes. Enjoy this discussion? Check out these related topics: Feedback system on mtvan, UN- FORESEEN CIRCUMSTANCES should the customer be warned, is about time we had a feed back system, Telephone Booking Service, Booking Form, Closing a job booking, Customer not allowed to assist with delivery, Crazy Customer Quotes, Courier feedback system on mtvan - rated couriers, WHAT BOOKING SOFTWARE ARE YOU USING. Powered by mtvan.com - Exchange Software V3.1. Generated in 3.3461 seconds.